Belfast is a city with deep rich history instilled in it. Driving just two hours north of Dublin, you will find yourself in the city center of Belfast. This is a city that sits in what is politically, another country. Northern Ireland identifies itself as part of the United Kingdom. The city is under control of the “Her Majesty,” more commonly referred to as the British government. 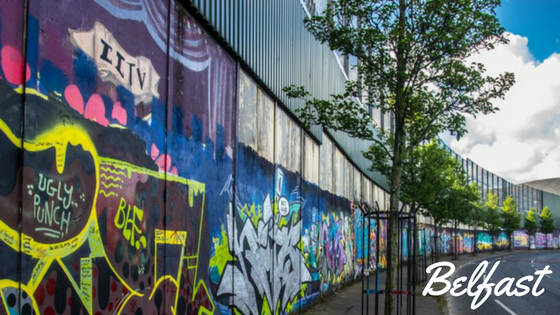 With recent history pertaining to rebellion, violence, and a journey towards peace within the city of Belfast, it is definitely worth the trip! The city began in the early 17th century and isThe city began as a small town with a population of 1,000. Despite the small population, Belfast was a very busy city. Wool, grain, butter, and salted meat were all exported from Belfast as well as wine and fruit. Belfast is mostly recognized today as the city which launched The Titanic in the year 1911. The Northern Ireland conflict began in the late 1960.The conflict ended with the Good Friday Agreement in 1988. The troubles mainly took place in Northern Ireland, but this did not stop violence from infiltrating throughout the rest of the country as well as Europe. The conflict was mainly political and nationalistic. A key issue was between the Protestants and Catholics. Protestants have British nationality and want Northern Ireland to remain with the United Kingdom. While the Catholics want Northern Ireland to leave the United Kingdom and join a united Ireland. The divide between the community is still very apparent today. 1974 – Irish Republican Army begins mainland bombing campaign targeting pubs and buildings used by British troops. 1981 – Bobby Sands and nine others die on hunger strike protesting their right to “political status” as prisoners. 1993 – Downing Street Declaration agrees to the principle that people of Northern Ireland can determine their own future. Shankill Road Bombing occurs. 2005 – IRA claims it has ended the armed struggle and withdrew its arsenal. How to get to Belfast? Touring this historic city can easily be done in a days trip. There are several different tour bus company’s that offer a multitude of different tours. I recently toured Belfast with the company Irish Day Tours – and it was lovely! I feel as though I got the full experience equipped with a very insightful tour guide, museum visits, a peace wall photo shoot, St. Patrick’s Cathedral, and the Dundrum Castle! Travel Ireland – Explore the Beautiful Town of Killarney!